Carrying a football field full of vehicles, and burning two-thousand gallons of fuel an hour, the Hawaiian Superferry is a poster child for unsustainability. However, it was the actions of the HSF Corporation regarding an environmental assessment that created the strong visceral resistance to any operation of the Superferry on Kauai. The ferry operators have been their own worst enemy. Activists who had been working on individual causes; like energy policy, overdevelopment, traffic congestion, ocean mammal protection, Hawaiian cultural integrity, invasive species, antimilitarism, et cetera; all came together to stop the Superferry, unless it completed an Environmental Impact Statement. People who had never thought about the implication of visitors "driving" to Kauai became alarmed. People who had never participated in a demonstration, found themselves in the water, breaking federal laws, to protect Kauai. Governor Lingle created the “Unified Command” by teaming the State of Hawaii with the Homeland Security Administration, the HSF Corporation, and the Kauai County Mayor’s Office. It was soon clear that the machinery of government, the military and big business was willing to use as much force as necessary to dictate what happened to Kauai. This uncompromising alliance only enflamed the situation further. Government hard-liners didn't seem to realize the degree to which their support for the Superferry undermined their own credibility and authority. When anti-Superferry protesters faced the armed U.S. Coast Guard, they realized that the Coast Guard was not protecting their homeland - Kauai - from destructive outside forces. It was turned landward to protect the Superferry Corporation from Kauai. Denying the Superferry a docking in Nawiliwili Harbor on August 27th planted a new seed of independence on Kauai soil. Dedicated activists, who never had thought much about the kapu/taboo subject of Hawaiian Sovereignty began thinking about it. The idea of taking control of our own lives and resources has begun to grow. This growth is being nurtured by external economic forces; foremost the ever rising cost of energy and the subsequent rise in transportation, housing and food costs. How the issue of sovereignty plays out on Kauai will be linked tightly to our island’s path towards sustainability. It is quite clear the means by which Hawaii became a territory, and eventually a state, was based on an illegal overthrow of the internationally recognized Hawaiian nation. America's 1849 Friendship Treaty with the Kingdom of Hawaii promised perpetual peace and amity. By landing marines with bayonets on Hawaiian shores in 1893, the U.S. provided the military muscle to support a coup, lead by businessman Stanford Dole, that imprisoned the Hawaiian Queen, and seized the islands. The Friendship Treaty may have been broken, but it was never abrogated. Moreover, the Kingdom of Hawaii has never given up its claim to sovereignty. American history reveals that Hawaiian culture and language was suppressed. Land and water was grabbed. 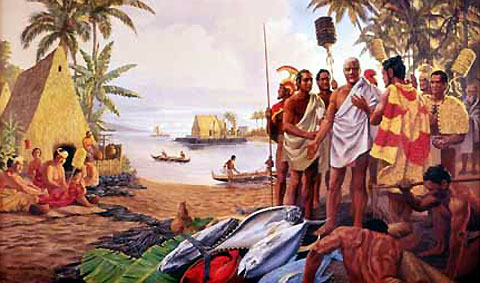 The Hawaiian population was destroyed by mainland diseases, yet the sense of an independent Hawaiian nation has persisted. But OHA has proved to be a disappointment to Hawaiians interested in sovereignty. Recently, the Senate Indian Affairs Committee unanimously passed an amended version of the Hawaiian Government Reorganization Act, also known as the “Akaka Bill”. OHA has supported and lobbied for this bill. The Akaka Bill relegates Hawaiian independence to the status "enjoyed" by indigenous American Indians, and we all know how well that has worked out for them. The Akaka Bill renounces any claims of national independence by Hawaiians, and provides the United States some legal authority here. I won't detail this history further. Read it for yourself, starting with the issue of the Bayonet Constitution of 1887. The record indicates that the nation Hawaii never ceased to exist and that the United States has no legal claim to Hawaii. Like the authority of the “Unified Command”, the authority of the United States to occupy Hawaii continues through the power of the U.S. military. "The Hawaiian Kingdom is a constitutional monarchy. The last Head of State was Her Hawaiian Majesty Queen Lili‘uokalani who died on November 11, 1917, without a lawful successor." "The Proclamation of Restoration of the Independent and Sovereign Nation-State of Hawaii of January 16, 1994, is hereby adopted on behalf of the people of the Nation of Hawaii, and is incorporated into this Constitution with full force and effect as law." "Hawaii shall be a Constitutional Monarchy operating under a direct democratic system of government; that the citizens of Hawaii shall possess the political right to secure life, liberty, and the pursuit of happiness." "The Kingdom of Hawaii is established as a sovereign Constitutional monarchy under the divine blessing of almighty God, supreme Sovereign of all creation. This Constitution affirms the structure of the government of the Kingdom and directs the manner by which that government shall comport itself in advancing the interests of the people." In 1993, one hundred years after the takeover, the U.S. adopted the "Apology Bill", U.S. Public Law 103-150, admitting America's wrong doing. That same year international law professor Francis Boyle, of University of Illinois at Urbana Champaign came to Honolulu . Boyle is an expert in independence movements and has assisted the Palestinian people in the development of their independent nation state and defended Bosnia-Herzegovina in the International Court of Justice. Boyle outlined what criteria is for international recognition of Hawaiian sovereignty. First, a fixed territory, and clearly we have the Hawaiian Archipelago. Second, a population, a distinguishable population of people - Native Hawaiians. Third, a government, and here you have the Kupuna Council, that you've traditionally supported. There are states in the Western Pacific that would give you diplomatic recognition. Professor Boyle returned to Hawaii in 2004 to give a keynote speech to a gathering of Hawaiian sovereignty advocates who met on Kauai. He was optimistic about the potential for international recognition of Hawaiian independence. However, he warned that the splits in the claims of sovereignty could sink the movement. His suggested that the sovereignty advocates agree to disagree. They should look to one another as political parties within a single nation and drop their claims of exclusive authority. They could then go to the people and compete for leadership authority. He went on to stress that sovereignty proponents begin to providing the services of a nation. This would include providing education, public works, social services and all that would eventually replace what is now provided by the existing state entities. What are the implications of this for us today? To a degree, the sovereignty movement has foundered because it has been divided on racial lines - with native Hawaiians (Kanaka Maoli) on one hand, and all late comers on the other. Obviously, the Kanaka Maoli are a tiny fraction of the population due to historic events and intermarriage. It is hard to build a successful change in governance, no matter how justified, with a tiny minority. Another distinction, sometimes brought up, is whether you were born in Hawaii or are a transplant. Although birthplace can be criteria for citizenship, it is not the only one. Commitment to sustaining a nation, understanding its history and supporting its culture are crucial criteria as well. It is my opinion that the enthusiastic participation of people with European and Asian backgrounds will be critical to independence movement. Many of the progressive activists that have come together on the issue of the SuperFerry are of from these backgrounds. They now perceive the State and Federal government as acting against the interest of Kauai. In realizing importance of protecting Kauai, some progressives now see they share a commitment with the sovereignty activists. As a result, they are less anxious, than they were in the past, about the implications of the sovereignty movement. They see room for a wider spectrum of people working for independence. I strongly feel that Hawaiian independence will be built from the bottom up. From the Ahupuaa (watershed) to the Kalana (district) to the Moku (bioregion) to the Moku Puni (island) and ultimately to Hawaii Nei (the archipelago). The current federal, state (and even county government) are out of touch, out of control, and facing an uncertain economic future. We will need to redefine and rebuild our communities after the failure of global petroleum economic culture. My advice to those interested in sovereignty and sustainability - start at home in your own back yard - grow some food. Then start talking to your neighbors. The more local, the more bettah! TGI Article #16: Kauai Land Use Plan Can we achieve sustainability by redefining our land use?